Unfortunately, Christian literature lacks this writing approach. Besides Philip Yancey, I can’t think of any Christian authors who approach their subjects in somewhat of a journalistic way. Instead, we have works that are originating largely from one point of view. Usually, I never really notice this aspect but in the case of Renovation of the Church, I began to scream for a different perspective. 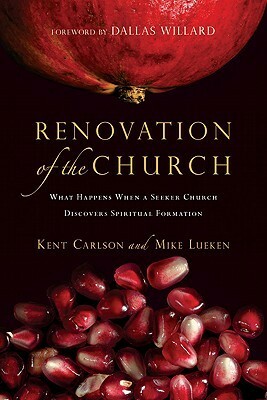 The authors, Kent Carlson and Ken Lueken, are the co-pastors of the church, Oak Hills, that is the subject of the book. They explain and present their transition from a church that is built on a consumer model of church organization to a church designed on a spiritual formation model. As far as I know, me being from one of the hotbeds of evangelical church environments, their approach is extremely novel and even “out there.” I admire their courage and commitment to this endeavor and am envious of their experiences and church life. But as a reader who is a thousand miles away from their church, I needed more from their story than observations from the driver seat. I wanted to hear the other side of the story. What was it like for a church member to experience such a drastic change? What conversations were church members having among themselves? What were the success stories? How has a focus on spiritual formation changed individual lives? Lueken gave a few examples but they were often sparse. This is where an outside perspective could have really made this story riveting. Instead, we get a hodge podge of commentary on the state of American churches mixed in with the authors’ personal philosophy on church leadership. In the end, we find out more about the authors’ transformation as pastors than we do the church’s transformation. This certainly serves a purpose and I am in high agreement with Carlson and Lueken’s criticism of the American church and its pastors but their was more to be told there. Personally, I could identify more with Eugene Peterson‘s tales of church work in his memoir, The Pastor, than I could Renovation of the Church. Peterson told stories on himself as well as members of the church he pastored. His stories could speek to the transformation that can occur in church and to churches under the reality of the Gospel. Carlson and Lueken never reached this level of reflection and expression. I am a Texas boy raised in a Southern Baptist church. I work at a private Baptist college. The use of Icons in Christian worship or spiritual practice is not something that has ever been in my spiritual heritage. Yet, when I saw that Henri Nouwen had written a book on the use of Icons, I knew that I could trust his direction and guidance. His book, The Way of the Heart, was an excellent guide to solitude and silence. He takes deep spiritual practices with nuanced types of uses and presents them as absolutely simple and doable. All while keeping a tone that is rich and bountiful and enduring. Though books like this are an introduction to the use of Icons, this is so much more than what you might find on a eHow.com page. Reading this book I discovered how non-visual Christian religion can be, especially in Protestant circles. I would normally read from this book in the morning and the images would stay with me for much of the day. I realized how useful strong visual images could be for the spiritual life. Many people are very visual in how they process deep ideas, why isn’t there more efforts to use imagery to express ideas? The only problem with an increased use of imagery in the Christian life would be how subjective our sense of art and imagery can be. For example, the Virgin of Vladimir is touching in the way the Christ child seems to be comforting the Virgin Mary instead of the other way around. But for me, the baby Jesus, with his adult features, is creepy looking and that distracts from the effect of the Icon. I know, Icons are not intended to be viewed in the same way you would view a Monet but these types of things often come down to taste and that means that not every Icon will touch people in quite the same way. Though Nouwen’s interpretations of the Icons were somewhat puzzling at times, his enthusiasm and heartfelt approach was infectious and sparked my interests in pursuing Icons further.